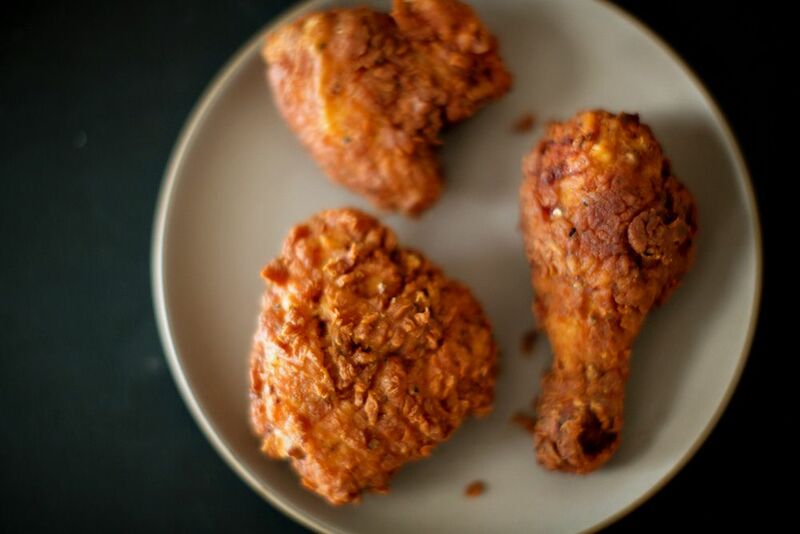 Today: Fried chicken you just can't mess up. 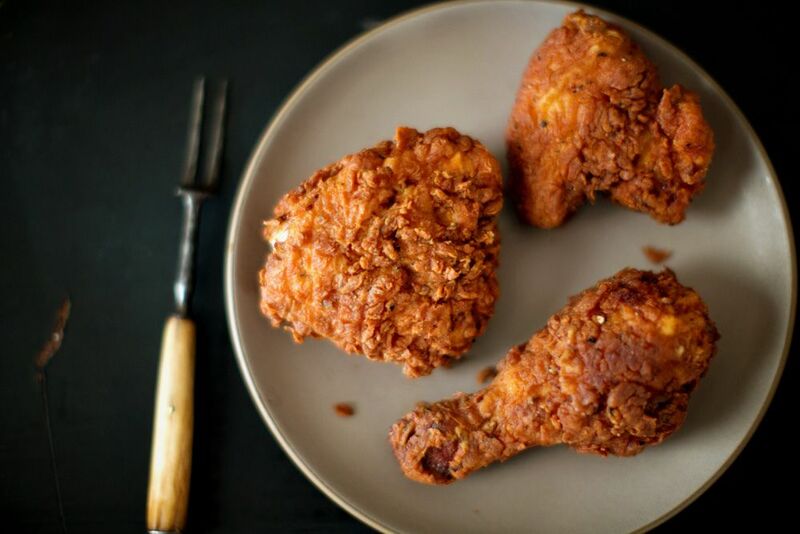 More often than not, if you are like me, you probably want fried chicken for dinner. But fried chicken seems like trouble, doesn't it? You'd sooner wait for a road trip to Mississippi than get frying yourself. And what if -- once you commit to frying your own -- its crust is soggy, its meat forgettable? Well, just stop it. 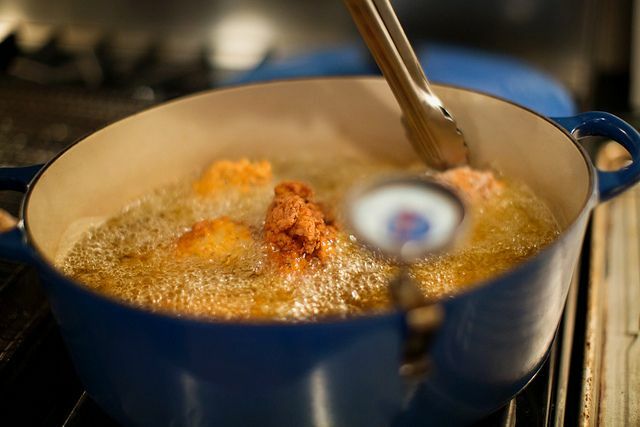 Here, thanks to Michael Ruhlman, is a fried chicken that will not fail you, that is speedy enough to fit into your busy, tired, chicken-deprived lifestyle, and that is more than worth what little trouble it asks of you. 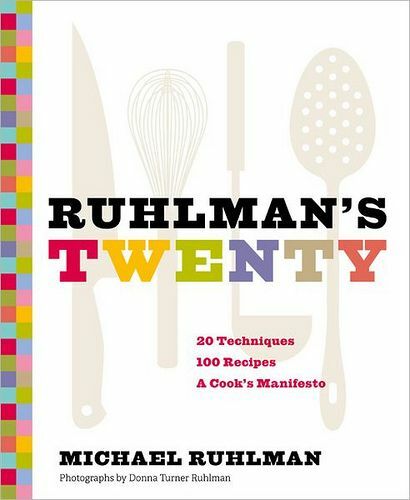 Ruhlman learned many (but not all) of his best fried chicken tricks while working on Thomas Keller's Ad Hoc at Home -- and streamlined them, as is his way, in his own book Ruhlman's Twenty. Food52er vivanat tipped me off to the ease and the payoff of this recipe, and now I'm a convert. You will be too. For starters, he uses just the thighs, legs and wings (to many, the good parts). Breaking down whole chickens has virtues, but you don't need to do that here. He brines the chicken, which is key to keeping meat flavorful and moist, and he does it well. Shauna Ahern, of Gluten-Free Girl and the Chef, once told me, "His ratios are perfect. 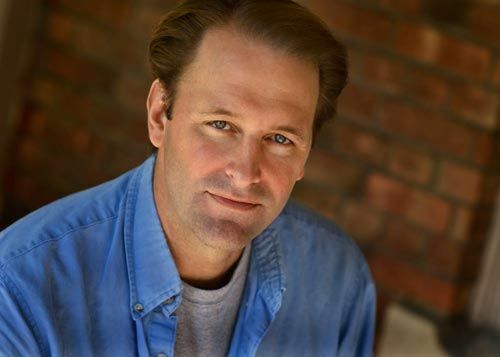 Whenever [my husband] Danny made a brine, he called me from the restaurant to read him Ruhlman's." Not just perfect, but shockingly quick to throw together. I tend to get all zen and methodical in the kitchen, and dramatically underestimate how long it will take me to get from point A to point B. Many Genius Recipe testing sessions end at 1am. My sous chefs hate me. And still, despite myself, it took me 15 minutes to go from chicken in grocery bag to chicken brining in the fridge. How does this brine get so flavorful, so quickly? 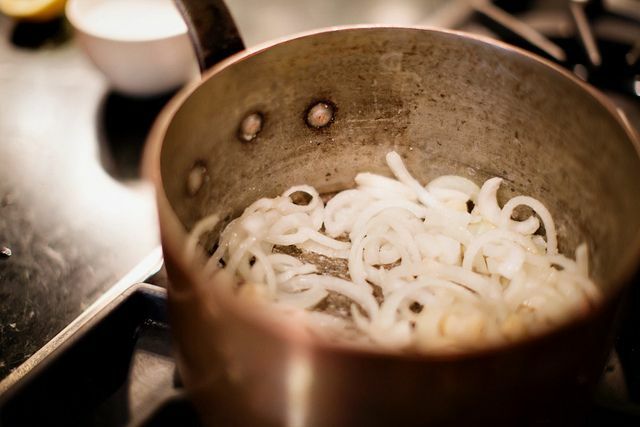 Namely, how do four cloves of garlic and a whole sliced onion go into a pot with one teaspoon of oil over medium-high heat, and quickly sweat into a soft puddle, without browning (or burning)? I didn't think it could be right, but I followed Ruhlman's directions, to the letter. I was forgetting about all that salt (it is a brine, after all). It instantly goes to work on the onions, drawing out their moisture, which pools in the bottom of the pot and helps it all swiftly cook down in its own juices. Then you toss in rosemary branches and finish it off with water and lemon. Boil, ice bath, throw your chicken in it. Wonder why it's not 1am. The recipe calls for brining overnight, but I've also done it for much less time, and it's still good. Once, when pulling this chicken out of its briny bath, my brother pointed out that this was the most delicious-smelling raw chicken he'd ever encountered. It's frankly a little jarring -- for good reason, raw poultry doesn't smell irresistible. You'll just have to control yourself. Brining behind you, tempting raw chicken messing with your mind, it's time for dredging and frying. This crust is one of those stand-on-its-own, thick, shaggy, crunchy affairs. Ruhlman credits the Ad Hoc kitchen with showing him the ideal seasoned flour-buttermilk-seasoned flour coating, but he trims down the ingredient list, focusing on what's important: lots of pepper, paprika, and cayenne -- and baking powder, for extra lift and crispiness. It's the kind of crust that you'd normally want to steal off other people's drumsticks and leave them the meat lingering on the bone. But remember that brine! As intoxicating as it smelled before cooking, it smells -- and tastes -- even more richly of rosemary and lemon, the salt having pulled it deep into the flesh. Best keep them away till the big reveal -- and what a reveal it will be. I prefer skinless chicken with the bone. Will this recipe still work without the skin? Technically it should, but the outermost layer of meat will be less protected from overcooking, so it might end up dry. OH..almost forgot...I used homemade gluten free flour mix I make. Couldn't tell the difference. Worked like a charm. AMAZING fried chicken! Only problem is the temp 350 turned my first 3 items almost black. Turned down eat to 300 and that made the chicken look a whole lot better. I used a digital thermometer to gauge internal temp since my pieces were rather large. 165 is the temp for doneness. Drying out the chicken all day using paper towels helped make this chicken so crisp! The brine could be tasted in the meat...rosemary! I used fresh lard for frying in. This made such a difference in not having that sluggish over-full feeling that fried food can produce.Everyone LOVED my darkly fried but so tasty chicken! thanks a million! What I don't understand is, doesn't brining add a lot of salt to the chicken? And isn't it healthier to oven bake than to fry in oil? 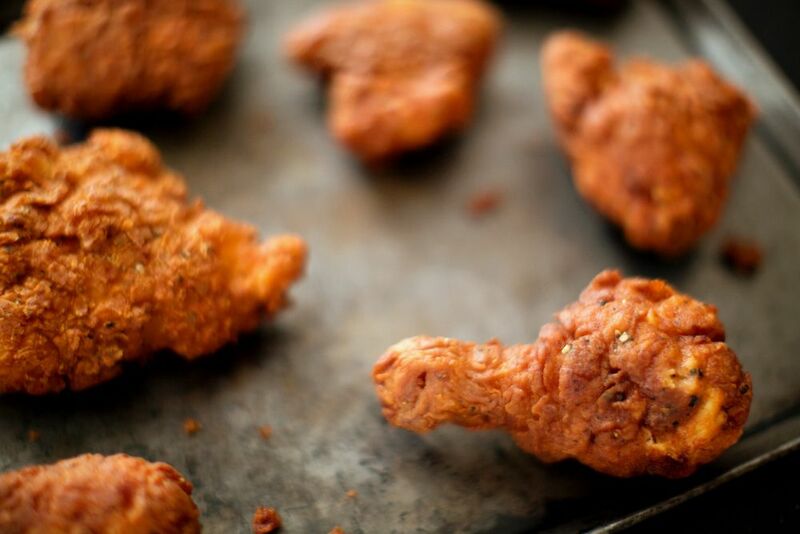 My favorite chicken part method is to dip pieces in beaten egg and dredge in whole wheat flour, then dip in buttermilk or ranch dressing and dredge in crushed corn flakes or bbq potato chips and bake in the oven. Mmmmmmmm, goooood. I tried the brine only and roasted the chicken. Fabulous! My husband normally does not like roasted chicken. Since then, I have used this brine recipe on beef and pork, too. Since each type of meat has it own distinct flavor, it is GREAT! This Christmas, we even tried it for our Black Angus sirloin tip roast. Everyone loved it with fingerling roasted potato alongside in the pan juices. YUM! I have the best luck when I follow my family's original recipe technique. As the Crisco is melting and heating up, pat the chicken, dredge it in the flour mix, then let is sit for about 20 minutes. Dredge it again in the flour mix. 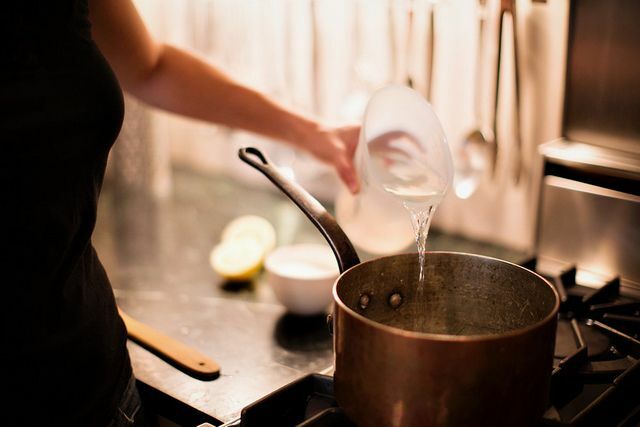 Shake off any excess flour, and put it right in the oil. The moisture that comes out of the chicken naturally is all you need to bind the flour to the bird. This just did nothing for me. Leftovers are languishing in the frig. Yes it is moist and yes it is thick crispy crust. But I am not a plain food girl and I want FLAVOR. More than just chicken flavor. I'm sticking with my fantastic soy sauce/lemon juice/sliced ginger/salt marinade, and i'll try the ruhlman crust on it. p.s. rosemary- the most overdone herb in the pantry.Bah, Humbug! I would love to make this, but am newly required to eat gluten-free. Would rice flour be the best substitute for the AP flour? I am quite new to gf cooking and unsure of good substitutions. 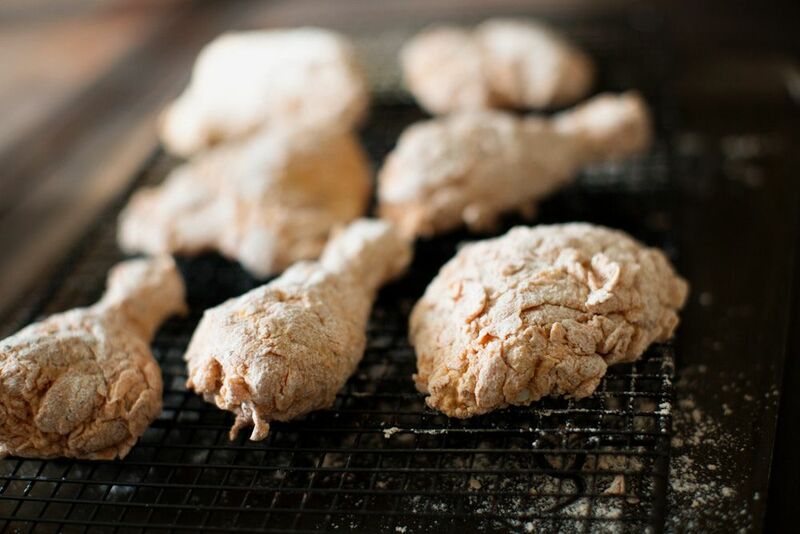 When I made this recipe for my friends, they were shocked to hear that they were eating gluten free fried chicken. I haven't tried 100% rice flour yet but my guess is that you'd be fine! 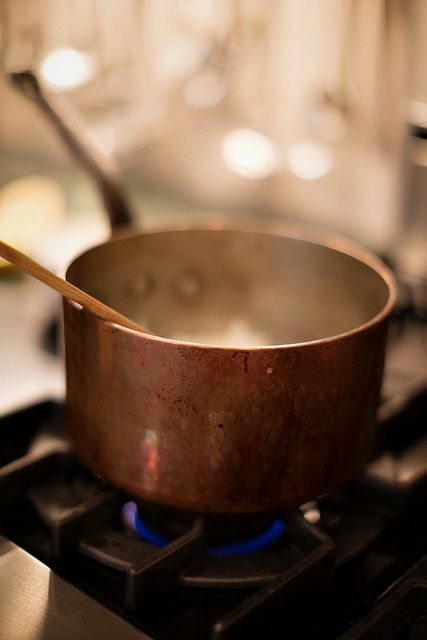 Once cooked and refriged, what temperature should you reheat the next day and for how long? Ruhlman reheats and recrisps at 250F -- I'd stick them in the oven (uncovered) 1-2 hours before you want to serve, since it will only make the meat more tender and the crust more crisp. Soaking the chicken in buttermilk with salt and spices added overnight (I do it for 24 hours) has yielded better results for me. The salt does its thing but the lactic acid in the buttermilk (I believe) helps the meat texture and flavor as well. If you want to cut down on the fat, brown your chicken in the pan and finish in the oven. So, you don't brine; simply soak in buttermilk and spices? Also, how long and what temp did you bake chx in oven? Thanks. I take the buttermilk add salt, garlic powder, paprika, cayenne pepper, mix it up put the chicken in, 24 hours is best but 8 hours can do it. After browning in oil 1/2 inch depth I finish off in the oven at 400 degrees until done which depends but for me is about 12 minutes or thereabouts. The first time I used a thermometer to check and thereafter I stay around that time. You do NOT have to go through all that for really good (Southern) fried chicken...Soak the pieces to be fried in salted water to pull out the blood. Eggs and buttermilk stirred..then dredge in a mix of flour, salt, pepper, paprika and a bit of rosemary....The real trick is to have your oil super hot and put in each piece, when lightly brown turn down the heat,when it reaches that dark rich golden brown take out of the oil..place on a brown paper bag with a paper towel on it (the best way to absorb the oil) let cool a bit serve..That is the real deal. I served this chicken last dinner for a dinner party along with a big pile of buttery mashed potatoes and a shredded Brussels sprout salad. Big hit, the chicken was moist very flavorful with just a hint of the rosemary from the brine. Per the recipe, I fried the chicken before guests arrived, and held the chicken in a 250 oven for almost two hours before serving. That helped the chicken get extra tender, drained some excess oil and crisped up the skin. Great recipe. This looks mouthwatering. But I must admit I tend to still prefer the breast. Any tips on adjusting for white meat? More cooking time....etc? Check out thirschfeld's tip for the breast below -- very cool idea. Otherwise, I like to just cut them in half but keep them on the bone so they're not too awkward and get more crust. They'll actually take less time than the dark meat that way, so just watch them and check the internal temperature if you can -- aiming for 165F. If you can't, do the old slice-into-one-and-peek. Ha! Fried chicken on the brain must be going around these days - this is going On The List! The brine recipe + dredging method = double genius! I fully intend to try the fried chicken, but in the meantime, I'm stealing the brine for grilled chicken and pork. 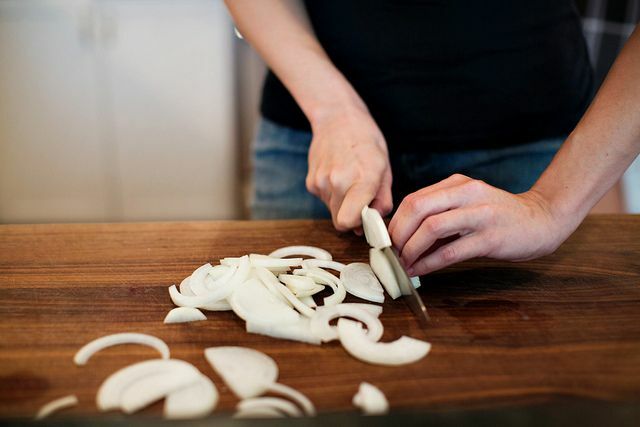 I've always thrown raw onions and garlic into my brine, but this technique makes so much more sense. I felt like I was watching a magic show the first time I cooked down those onions. I wish I could dump 3 tablespoons of salt on everything I'm sauteing, but that's probably a bad idea. Do I understand correctly that the finished pieces will hold in a 250 degree oven for up to two hours before serving? Hi there -- we just discussed on the Hotline, but I'll post the answer here too so others can see it! Ruhlman says you can either hold in a low oven for a couple hours or cool, then re-crisp them: "If holding for more than two hours, would cool and fridge uncovered then reheat and recrisp. Fab the next day as well." This just went on my bucket list. I assure you while I love the brined and fried this is amazing and when I come across good lard it is a go to recipe. I often fry rabbit and when I do I always use peanut oil with a slice of pancetta that I let render into it. It is a great recipe and it is genius. There is a restaurant here that is known for its fried chicken. They have been serving it for god only knows how long, 40 years maybe, and they cut double lobed breast crosswise instead of along the cartilage. They cut it into 3 or 4 strips and, usually I don't like the breasts fried either, they stay moist and cook at about the same rate as the rest of the chicken. I have also found if you want a crispier crust try cup4cup flour, the cornstarch adds a nice crunch. Such genius tips. I secretly like white meat too, so this is great news.